Experimental setup of underwater optical wireless power transfer. Recently, wireless power charging has attracted considerable attention and has been rapidly deployed in real-life applications. For example, underwater robots working for a long time, it could be efficient to charge the batteries wirelessly without replacing them. However, the radio frequency (RF)-based wireless power transfer is not efficient in the water, especially in the long distance over a meter, because the absorption of RF waves is severe in the water, whereas that of visible light is relatively low. So, the researchers studied a new optical wireless power charging technology using laser for charging an underwater robot wirelessly in a far distance over a meter. 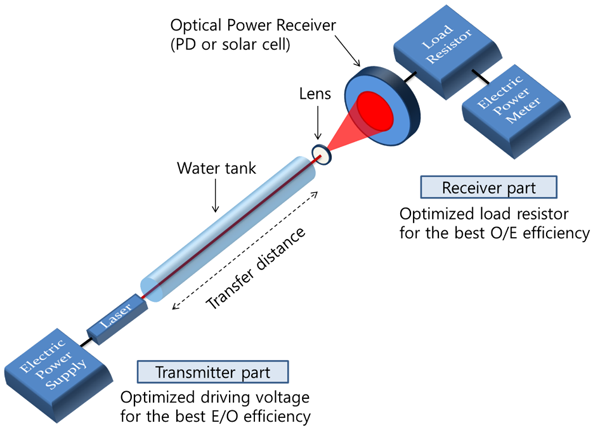 In this study, the research group experimentally demonstrated an underwater optical wireless power transfer using laser diode (LD) transmitter and two types of optical power receivers: a solar cell and a photodiode (PD). A mathematical expression for the transfer efficiency of optical wireless power transfer was also derived. The maximum electric-to-optic (E/O) conversion efficiency of the LD was 47.4 % with the optimization of the operating voltage. The maximum O/E conversion efficiencies of the PD and the solar cell were 10.4 % and 8.7 %, respectively, with the optimization of the load resistance and incident optical power. However, the optimum points of the LD and the receivers are different, so the researchers calculated the transfer efficiency by multiplying the efficiencies of the LD and the receivers at each power level. Our experimental results show a total transfer efficiency of 4.3 % in the near distance. They also showed an attenuation of 3 dB/m in the seawater, which means that the transfer efficiency drops to a half after each one meter. The results have been published in Chinese Optics Letters, Vol 16, Issue 8, 2018 (S. -M. Kim et al., Experimental demonstration of underwater optical wireless power transfer using a laser diode). "It is a very valuable study that has experimentally verified the possibility of underwater optical wireless power transfer technology," said Dr. Sanghwa Yoo from Electronics and Telecommunications Research Institute (ETRI), "We are already expecting many new studies to begin with this paper." Now, the researchers can deliver power wirelessly with a transfer efficiency of 2 % up to 1 m in the seawater. Although currently the transfer efficiency seems not to be enough for real applications, the researchers expect that the transfer efficiency can be enhanced up to more than 20 % after further researches. The researchers believe that optical wireless power charging technology will be used for long-distance and underwater wireless power charging and our report will be a first step.